New York: The recent rally in government bonds globally may be nearing its 11th hour after a historic flight to safer assets pushed yields down to their lowest since World War II. But the moment the proverbial clock will strike midnight is the multi-trillion dollar question for bond investors. “The iron law of fiscal expansion means government issuance cannot be revised down. 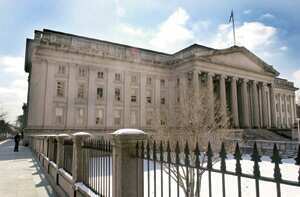 The bonds will be sold, the question is, (at) what price," said Meyrick Chapman, rates strategist with UBS in London. Timing is everything for fund managers still betting government debt yields can go lower, or for those temporarily hiding out in those markets and waiting for treacherous sell-offs in corporate debt and stocks to abate. Once the credit crisis eases, allowing lending to flow more smoothly among banks and corporate debt markets and the downtrodden global economy shows signs of bottoming out, then investors could desert government debt in droves, triggering a vicious sell-off. “Somewhere along the line, and I am not smart enough to tell you when, some of this massive amount of money will start moving back into other types of instruments," said Leonard Santow, managing director of economic and financial consulting firm Griggs and Santow in New York and a former financial economist at the Dallas Federal Reserve. “Come on: three basis points on (US) treasury bills," said Santow. “If that’s the way things are forever, we have real problems, so somewhere here, whether it’s three months or six months away, those rates will start to be more normal. That will obviously push rates up along the curve to something half-way reasonable." While the US three-month treasury bill rate has fallen to near zero, as panicked investors flee equity markets for the shelter of ultra short-dated government instruments, the benchmark 10-year US treasury note yield slipped this week just below 2.99%, the lowest in five decades. But a year from now the 10-year note’s yield will have jumped to between 4.25% and 4.75%, Santow estimates. “A very strong case can be made that treasury rates will have to go up" as issuance inundates the pool of $4.9 trillion (Rs244.51 trillion) treasury securities outstanding, he said. Santow expects between $1.75 trillion and $2 trillion of US government debt supply in the remainder of the fiscal year through September 2009, with $600-700 billion in treasury bills; the rest in notes and bonds. In the euro zone, sovereign debt issuance is likely to run to at least €700 billion (Rs45.29 trillion) in 2009. In the UK, the Debt Management Office plans to increase sales of gilts to a record ­­£146 billion (Rs17 trillion) in the current fiscal year. Ironically, the eventual trigger for a sovereign debt sell-off that would plunge major governments and corporate borrowers deeper into debt may be signs that today’s bailouts costing trillions of dollars are starting to succeed in refloating the global economy. But for now, government bailouts are still swimming against the economic tide. In what may prove to be the most severe global downturn since the Great Depression, hefty investment flows are unlikely to shift out of government debt and into corporate bonds anytime soon. For now, rising US government supply “can be absorbed fairly well", said Derrick Wulf, portfolio manager at Dwight Asset Management in Burlington, Vermont. The danger of corporate debt “crowding out" treasurys will be limited, Wulf said. Yet he is starting to hedge against the risk that treasury prices could drop once the economy starts to show signs of life. “You buy risk assets. Now is as good a time as any. Some of them are providing equity-like returns," Wulf said, although he is buying corporate bonds cautiously, he said. Though deflationary pressures are now taking hold across the world as commodity prices fall, bond market analysts do worry that the dramatic expansion of debt issuance may later rekindle inflation, anathema for bonds. “There is (also) an irony that the reason we got into this mess is ostensibly due to lax lending," Chapman said. “Now governments everywhere are doing their best to be as lax as possible in their lending." That destabilizing scenario for government bonds could be a distant prospect, some fund managers reckon. “Until we arrest the decline in prices or deflation, it (inflation) is not a huge concern," said Wulf. “Inflation concerns may come in 2009," he said, but added that it may take five years from now for yields to move a lot higher. Jamie McGeever contributed to this story.